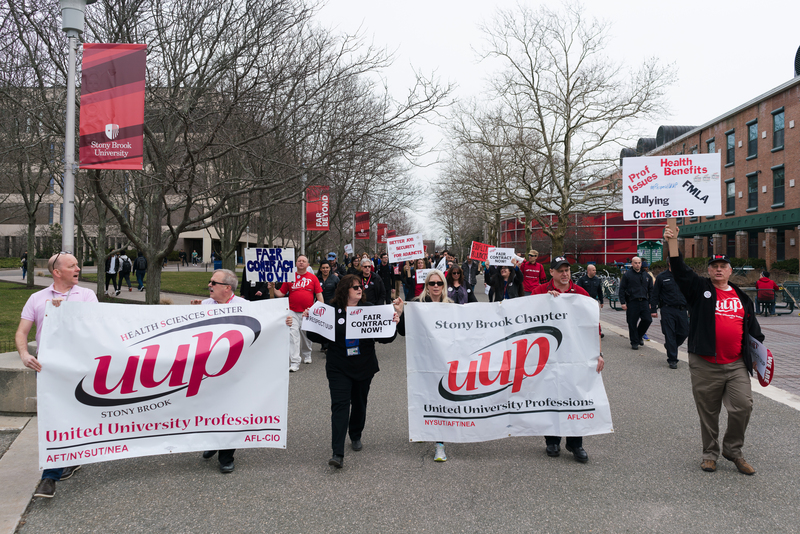 Several dozen members from Stony Brook University’s chapters of the United University Professions (UUP) union joined on Thursday to demand a fair contract since the last one expired 20 months ago. “We want the respect that we deserve as state employees to negotiate in good faith,” West Campus Chapter President Kevin Moriarty said. The other two major unions within the SUNY system, Public Employees Federation and Civil Service Employees Association, have reached a contract agreement. Meanwhile, UUP has been unable to reach an agreement since July 2016. This is due in part to infrequent meetings between the union and SUNY top negotiators, as well as the state’s inability to concede on certain measures regarding pay raises, Moriarty said. “Right now, it’s down to the money,” UUP President Frederick Kowal said. Aside from salary increases, Kowal said issues like paid family leave, competitive on-call/recall pay and compensation in addition to across the board salary increases had been holding up the contract negotiations. SUNY did not respond to requests for comments. Demonstrations on SUNY campuses from Albany to Plattsburgh to Morrisville also took place that same day. According to the UUP website, the group is made up of more than 42,000 members across 29 SUNY campuses. Ushinde Payne, a physical therapist at Stony Brook University Hospital, marched along the crowd as they chanted “What do we want? Contract! When do we want it? Now!” Although health care and cost of living keep on increasing, Payne said his pay has remained the same. “More is being taken from us, and we’re getting less for it,” Payne said. Sarah Battaglia, assistant to the chair and graduate program coordinator of the School of Health Technology and Management’s occupational therapy program, said that thanks to UUP’s efforts, she was able to work after losing her job as an assistant to the chair of department of Hispanic languages & literature after the merger of three language departments. “I was very fortunate that UUP was there for me because I would be unemployed,” she said. At the end of the rally, Kowal and chapter presidents delivered a petition requesting a fair and reasonable contract to President Samuel L. Stanley Jr.’s office. Moriarty said Stanley accepted the petitions, but did not comment on the matter. Thomas Sheroff, a senior philosophy and psychology major and founder and secretary of the Young Democrat Socialists of America club, gave a speech in front of the rallying crowd saying the club members showed up to show solidarity with the union. Kowal said he believes that students have significant power in terms of advocating for educational issues. “I think students being involved in this, not just for your own welfare but for the welfare of all, because that’s what the fight is about, a better state university,” Kowal said.